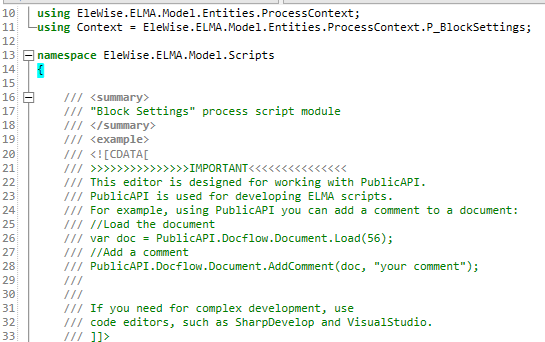 It is recommended that you create simple scripts in ELMA using Public API. Public API – is a set of system methods, compiled into a hierarchic structure and intended for creating scripts in ELMA. To learn more about working with Public API, see this article. Starting with version 3.8, the script editor is simpler – many functions were dropped to improve the system performance. However, the possibility to work in the advanced editor remains, For this, you can use the SharpDevelop environment, which is built into ELMA Designer, or VisualStudio 10, 12 or 13, if it is installed. Due to this, starting with version 3.8.6, the script editor in ELMA Designer features a notification (fig. 1), with important information. Let's take a closer look at working with code SharpDevelop. It is useful for more complex scripts, where PublicAPI is not enough. 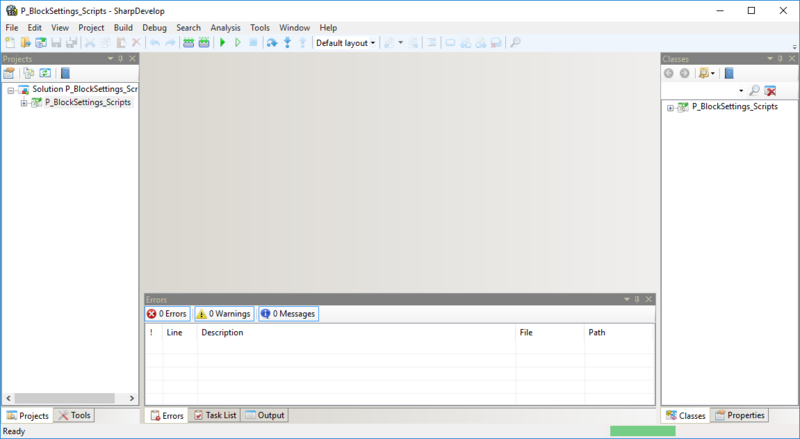 To edit a script in SharpDevelop, in the script editor click Open in SharpDevelop (fig. 2). You may be required to confirm your action in the user account control dialog box (fig. 3). The SharpDevelop environment will open (fig. 4). While working in SharpDevelop you will not be able to edit the script in ELMA Designer. 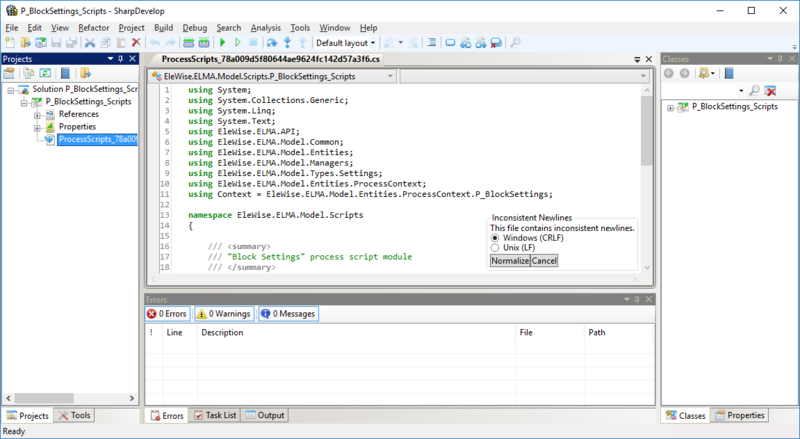 The Designer window will be showing a notification that the script is currently being edited in a development environment (fig. 5). 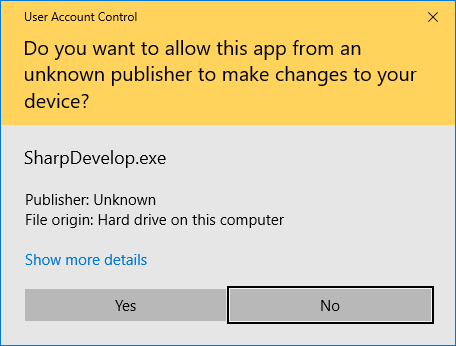 If you click Complete, the SharpDevelop environment will be closed and the changes will not be saved. To start editing code in SharpDevelop, double-click on the required script in the Projects menu – a script editor window will open (fig. 6). Writing code in SharpDevelop is very similar to writing code in the Designer. For example, to add a namespace, enter the required name and press Ctrl+T. To check the script for errors, press F9. The check may take a while, wait until it is complete. The information about detected errors will be displayed in the Errors window (fig. 7). To save the changes, press Ctrl+S. If you do not save changes and try to close SharpDevelop, a dialog box will be displayed (fig. 8) asking whether you want to save the changes.